See this is me, heading West. West looks really good right now. They decide to act like normal shoppers to fly under the radar. How Noma, an angel and Alex, a man born during the collapse of society, knows how a supermarket works is not explained. Anyway, they end up killing them all anyway and only belatedly address Noma’s grief and pain: she doesn’t know if he can save her and she doesn’t even know what she is any more. He has some trite words of comfort for her along with kisses. In Vega, Claire and Gates continue to be couply – and someone murders several people in her tower. Arika blames rebel sympathisers (though I suspect Arika). Claire decides she wants to make a deal with Zoe. Zoe is busy negotiating with various factions when Claire launches her counter to get their attention – and shuts off the electricity to Zoe’s half of the city. This ends up with a meeting planned – and Gates finally mentions some suspicion about Arika. Zoe and Claire meet, without Arika, a change of plan. Claire’s deal for Zoe is “surrender and trust I’ll let you work with me” or she sends in the soldiers. Zoe says yes (really?) but then a sniper ruins the whole thing and everyone drives away. Claire is shot in the leg. …but but but peace worked?! It worked! Some guy tried to derail it, you IDENTIFIED that he was trying to derail it and then let him derail it anyway?! Claire survives the shooting – but miscarries. Zoe is hyper pissed off and has the guy who David paid brutally beaten to death without listening to what he said. 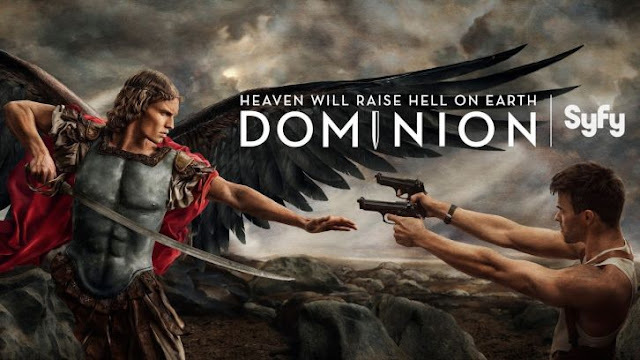 I’m pretty sure at some point we lost the focus on this show… I mean, it was about angels trying to wipe out humanity, led by Gabriel. He was the big bad. He was the threat. Yet… killing Gabriel (these last few episodes) when I’m pretty sure they’ve had the chance has been waay waaay down on their priority list. And this whole attempt to redeem Gabriel? He is literally the cause of every bad thing that happened on this show?! He now decides to sacrifice himself so Alex can save his chosen child? Oh that’s nice – shame about the billion kids you massacred but, hey, Michael can now save his chosen one! REDEMPTION!!!! I think a lot more could have been made of rebel sympathisers in Claire’s camp – after all this is a class war. Who cooks Claire’s meals? Who guards her? Who cleans her floors? There’s got to be a lot of V1s around Claire at any given time. And can we address Zoe? Either Zoe thinks she can work with Claire – in which case why didn’t she take the chances before? Or she doesn’t – in which case why does she think “you won’t let the soldiers kill your own people” is a reasonable thing to say? Does Zoe think Claire cares about the V1s or not? Did we really waste that much time on supermarket 8 Balls, saying beep when using a till?